Laurin McCracken combines many of the skills he learned as an architect with his experiences of studying art history, drawing, taking photographs and visiting many of the world’s leading museums to use as a watercolorist. Born in Meridian, Mississippi, he studied at Auburn University and holds a Bachelor of Arts and a Bachelor of Architecture from Rice University and a Masters in Architecture and Urban Planning from Princeton University. He currently lives and paints in Fort Worth, Texas. 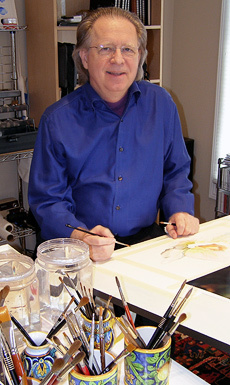 He is a signature member of more than a dozen watercolor societies including the American Watercolor Society, National Watercolor Society, Transparent Watercolor Society of America, Southern Watercolor Society, Watercolor West, and Watercolor USA Honor Society. He is an Elected Member of the Allied Artists of America in their Watermedia Category. His paintings have been included in multiple shows in China: Shanghai Zhujiajiao International Watercolor Biennial Exhibition 2010 &amp; 2012, the Beijing International Art Biennale 2010; 2012 and 2015; the Shenzhen International Watercolor Biennial 2013 and 2015; and the Qingdao International Watercolour Salon, 2014. His paintings are included in the permanent collections of the National Museum of China; of the Asian Museum of Watercolor Art in Haikou City, Hainan Province, China; and The Watercolor Museum in Fabriano, Italy. His work has been published in many national and international magazines and books including: Watercolor, Watercolor Artist, Artist’s, Drawing, American Artist, International Artist and Southwest Art. His work has been included in books such as Splash 9-20; Strokes of Genius 2 & 3, Secrets of International Watercolor Masters, Volume #1 published in China, Masters of Realistic Imagery published in Germany and Masters of Watercolor published in St. Petersburg, Russia. His work is represented by Southside Gallery in Oxford, Mississippi, and Cassidy Bayou Gallery in Sumner, Mississippi. I am a realist watercolorist whose work is largely influenced by the Dutch and Flemish Still Life painters of the 16th and 17th Centuries. My goal is to record the world around me with a high level of detail. This is not a painting style that is typically associated with the medium of watercolor. Look closely at one of my painting and you will not only see the objects in the paintings, but you will also see reflections of other objects within the very objects I paint. From a training standpoint, as an architect, I know how to do detail things. I approach a painting from a strategic standpoint, determining what I am going to paint first, second and last. With a water-based medium there are surprises. It is a process that is very architectural filled with many knowns and some startlingly wonderful surprises. I use my ability to see things with a high level of acuity to transcribe what I see in the world around me into watercolor on paper. I use this historic influence to record the beautiful things in our lives: the flowers, ornate crystal and silverware, clouds, the glassware I grew up with, toys and anything that attracts my eye and spurs my imagination. Along with my architectural training, I have also become a photographer. This has helped me develop the ability to see things in fresh compositions and in a level of detail that many others do not see. Not every painter can see things uniquely, but it is imperative that a painter see things differently and with a certain clarity that the average individual might not see. That is the value we bring to our craft. It is the combination of those abilities and a fundamental mastery of the craft that makes us artists.